"He Was Able to Restrain Thunderbolts and Tyrants"
"No other town burying its great man, ever buried more of itself than Philadelphia with Franklin," wrote Carl Van Doren in his biography of Franklin. Franklin himself had composed the black-bordered Pennsylvania Gazette which announced his death. 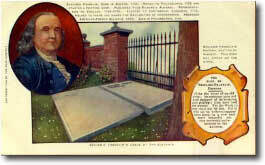 Dr. Jones, Franklin's physician, informed the readers of Franklin's final illness. He had been suffering from empyema, pus filling in his lung brought on by attacks of pleurisy many years earlier. His temperature was high. This made breathing laborious, and he almost suffocated. After several days of breathing woes, the pain went away for a day, upon which he left his bed and asked that it be made properly so that he might have a dignified death. His daughter, Sally, told him that she hoped he would live many years more. "I hope not," he replied. An abscess in Franklin's lung burst and he passed into a coma. He died on April 17, 1790, with his grandsons William Temple and Bennie at his side. 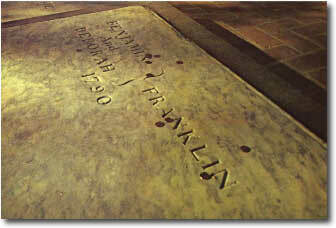 Benjamin Franklin was 84 years old. On April 21, the funeral procession gathered at the State House. Leading the cortege was the clergy of Philadelphia. Though Franklin was not a regular churchgoer by any means, he had aided the churches by raising funds to help their construction. His coffin was carried by the citizenry of Philadelphia. Dignitaries surrounded the Pall including Revolutionary Era Philadelphia mayor Samuel Powell, astronomer David Rittenhouse, and several members of Pennsylvania's Supreme Executive Council. Judges and current Philadelphia politicians were also in the mix. They were followed by the printers of the city and their apprentices. Franklin always considered himself a leather apron man, a mechanic, a printer. "Keep they Trade, and thy Trade will keep Thee." Then came members of the American Philosophical Society, which was co-founded by Franklin in the 1740's. Next came members of the College of Physicians. Franklin was a founding member of the Academy, which became the College of Philadelphia, which had created the College of Physicians, the first medical school in the country. The Society of Cincinnati found its way into the procession, though Franklin had derided their philosophy of making honor hereditary. On the cortege wound, composed of citizens of all stripes, headed toward the Christ Church burial ground. It is estimated that 20,000 mourners gathered for the funeral. Bells of the city church's were muffled and tolled. 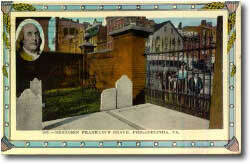 When Franklin had arrived in Philadelphia's port on October 6, 1723, he was a broke runaway. Now the ships in the very same harbor Franklin had arrived in flew their flags at half-mast for the man who had enriched the world. One must wonder what the author of Poor Richard's Almanack might think of such a practice though. On the one hand, a man famous for the line, "A penny saved, is a penny earned," would not like throwing money away; on the other hand surely Franklin would recognize, it is only "common cents" that we would look to him for inspiration.